Through good luck and healthy cowardice, Misty has survived the earthquakes that have torn the world apart, but has no skills to speak of. Or so she thinks. She does have blood, and someone must feed the vampire who has offered his protection and strength in exchange for sustenance. Feeding Ivan is a priority, and Misty finally serves a purpose. But when she awakens tied to his bed, an unwilling gift to Ivan from the townspeople, she discovers he has hungers other than blood. Hungers he expects her to satisfy in the most carnal manner. Under his seductive persuasion, Misty discovers she has the power to sustain Ivan in all ways-while experiencing unspeakable pleasure herself. A PR stop brought to you by Bewitching Book Tours. 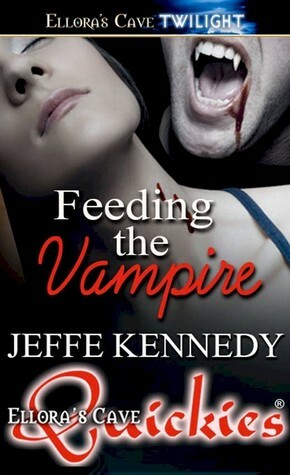 Yummy 😀 Yummy, yummy read, yet again, by Jeffe Kennedy, my second after Sapphire. I find a delicious similarity between the two, in that they both explore the notion of power play, but each in its very own different way. Here the couple features a vampire and a lovely “little rose” in a post-apocalyptic sort of scenario. It’s a nice twist to have the vampires come out of hiding in this scary new world, as protectors in exchange for sustenance. Slightly medieval in a way, the village pays tribute to their vampire lord and he protects them and their resources in exchange – but I think when in dire conditions, we revert to our most basic ideas and ways of life. The scenario was very well set and built, and in such a short read it’s not necessarily easy to accomplish that. Of course, I’m team Ivan (awesome name, right? I heart Slavic names), but you guys expected that I’m sure. He’s sort of awesome, intense and strong, but somehow decent and actually sweet, a killer combo. Misty was totally adorable, funny, daring, and brave really, I mean it takes some guts to offer yourself as main course for a hungry creature’s midnight snacks (xDDD), though when she offered she thought it would involve less then it ends up involving. The chemistry of Ivan and Misty was really awesome, and their play-time was great to read; of course, if you’re iffy about vampire-related-play, you might want to skip this, but if you’re not I say you should totally read this short, smoldering little darling. I had a blast reading it, fu~fu!